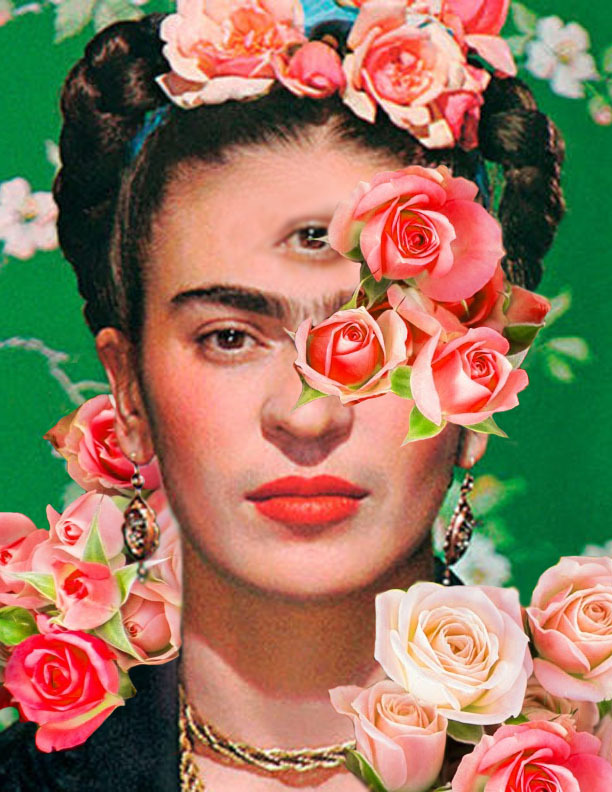 Frida Kahlo is a surrealist Mexican artist that has inspired me since I was young. She had such an iconic and unique look, which I felt would make an interesting portrait to GIF. In Photoshop I used the clone stamp tool to paint in the third eye. I then used the blur tool to blend in the sharp edges so it fused seamlessly into her forehead. I pulled a photo online of a bouquet of flowers, cropped and blended them into the images. I used a mixture of the blue tool, eraser tool, and selection tool to achieve this. The most difficult aspect of this edit was changing the color of the flowers. The flowers were a reddish pink color, in-order to match the inserted flowers to the ones in her hair I adjusted the hue/saturation of each new inserted layer. Here is my final image edited image of Frida Kahlo.